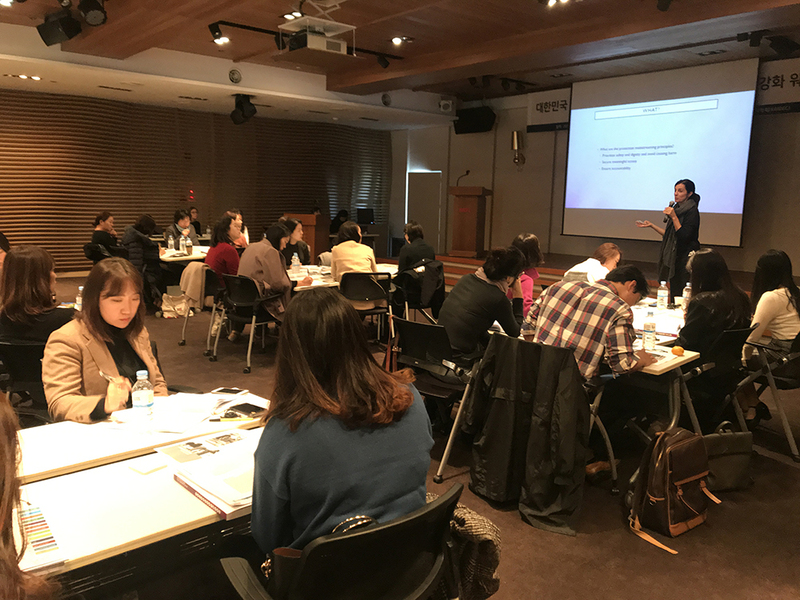 Seoul — IOM and Good Neighbors Korea last week organized a capacity-building workshop in Seoul on how to respond to Gender-Based Violence (GBV) in humanitarian interventions. Some 40 field practitioners from Korean NGOs and gender-related organizations took part in the event, which was sponsored by the Korea International Cooperation Agency (KOICA) and the Korea Association of International Development and Cooperation (KAIDEC). The workshop was designed to raise awareness of GBV and enhance the capacity of participants to address the problem, which is a human rights abuse that occurs in most complex humanitarian emergencies, regardless of region and disaster type. IOM has led efforts to integrate gender mainstreaming in its design, implementation, monitoring and evaluation of policies and programmes. Its Institutional Framework for Addressing GBV in Crises (GBViC) aims to systematically strengthen efforts by IOM and other organizations to prevent GBV. “Despite GBV being one of the most widely and historically witnessed forms of violence in crises and displacement, there are still gaps in terms of legal mechanisms and data management to ensure a gender perspective in all humanitarian activities,” said Miah Park, who heads IOM’s office in the Republic of Korea (ROK). “The workshop was a great opportunity to share IOM’s GBV expertise and to enhance awareness about GBV among ROK aid workers. It also equipped them with practical skills that they will need when supporting this very vulnerable population,” she added. Maria Moita, IOM Regional Emergency and Post-Conflict Specialist for Asia and the Pacific, and Monica Noriega-Ardila, an IOM GBV specialist in Geneva, led the workshop, which focused on the IOM GBV framework and other guidelines developed by the Inter-Agency Standing Committee (IASC). “Lack of coherent and holistic GBV response approach to tackle related stigma, insufficient awareness and limited data are major obstacles for GBV prevention, mitigation and response. This is the reason we need to take collective actions between organizations, donors and communities to build a systematically integrated approach in combating the ongoing human right violence,” said Moita. Case studies of GBV prevention and response mechanisms discussed included ongoing efforts in the Rohingya refugee camps in Bangladesh and among conflict-displaced populations in Northern Nigeria. Professors Jihyun Lee and Sunhee Kim of the Seoul Women’s University also facilitated two sessions on psychosocial support for GBV survivors, focusing on a case study from the 2015 Nepal earthquake to discuss essential components of psychosocial support, mental health interventions and applicable therapies for victims. Since 2015, IOM ROK has provided a wide range of capacity-building trainings for Korean humanitarian actors, including Data Analysis and Management Training, and Safe and Secure Approach in Field Environment (SSAFE) training, funded by the Office of US Foreign Disaster Assistance (OFDA).